In the aftermath of war there comes the problem of what to do with the sudden influx of former soldiers into the labor pool. This problem was especially severe after the end of the First World War. Nearly every able-bodied British male was called up by the war's end. In Australia the returning soldiers were given land to farm, and most of them managed to make a go of the proposition raising wheat or sheep. Then came the Great Depression of 1929. Wheat prices fell and many farmers who had managed before were now having a tough time. The emus had always been around, but the ready supply of water that accompanies farming attracted then and in 1932 some 20,000 marauding emus descended upon the soldier-farmers like a plague of well, emus. The soldiers, being a bit distrustful of the Ministry of Agriculture, naturally went to the War Ministry for help as they knew how to deal with its chain of command. Their efforts were rewarded and the Minister of War, Sir George Pearce, dispatched several companies of men armed with heavy machine guns to sally forth and save the crops. Alas, things did not go as planned. The emu, being a large flightless bird, does not travel in flocks and tends toward more solitary behavior. It also turns out to be extremely difficult to herd them, as they are the size of a man. In short, there was a great and prodigious expenditure of ammunition with very few dead emus to show for it. It is a wonder that where were no men lost to "friendly fire". 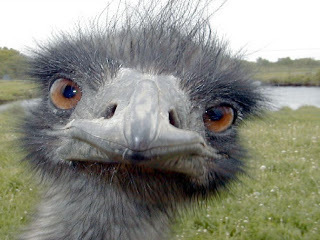 A subsequent attempt to kill emus involved mounting a machine gun on the back of a lorry and driving it after a small group. Not a single bird was killed, not a single bullet was shot (the gunner had problems enough hanging on) and a stretch of fence was destroyed when the truck careered into it." The whole misadventure was ended by a series of mocking questions in a meeting of Parliament on Nov. 9 of that year. One of the members asked, with tongue in cheek, if any medals ought to be awarded for the campaign. The representative from Western Australia suggested that the decorations be awarded to the emus, as they had won every engagement.